The BrightstarDB SdShare Server is designed to be used to expose RDF data from existing data sources. The data produced can be easily consumed into a BrightstarDB instance or any SPARQL compliant data store. The server has a pluggable architecture to allow any data source to be exposed in accordance with the latest SDShare specification (SDShare), it comes with configurable components for ODBC enabled databases. The SdShare Server provides two main features, firstly it exposes existing data sources as feeds of data that comply with the SdShare specification.Second, it runs a client service that can consume and process valid SdShare feeds. Both the producer and consumer services offer a pluggable framework to support different data sources and data destinations. 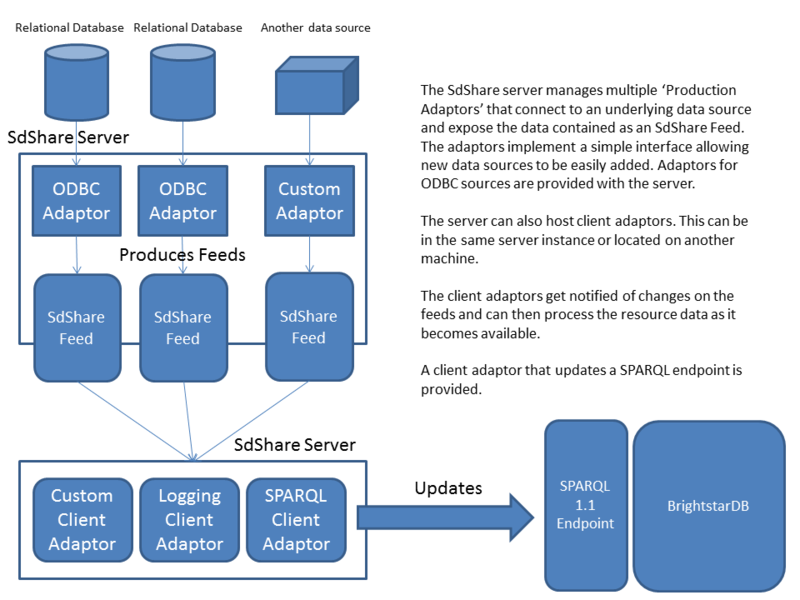 In addition, a data source adaptor is provided for exposing data via any ODBC compliant database and a client component is also provided that can send updates from an SdShare feed to any SPARQL 1.1 compliant endpoint and BrightstarDB instance. The following diagram shows the server architecture.